Netholi meen peera pattichathu is a tasty and healthy side dish. Anchovies ( കൊഴുവ ) are small, shiny, silver fish popular in Kerala. It contains lots of nutrients and vitamins. Anchovies have lots of health benefits. It helps to keep a healthy heart, lower the bad cholesterol, improve skin health, strengthening teeth, etc. Kozhuva can make as fry, gravy, or “peera”. Kozhuva meen peera is a tasty dish with rice, chapati, etc. Try this healthy dish in your kitchen and enjoy! Clean the Kozhuva and wash it thoroughly. Heat the Earthern pot (meenchatti). 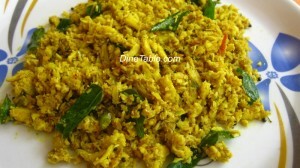 Add the cleaned kozhuva, chopped ginger, turmeric powder, salt, red chilly powder, kudampuli, 1 cup of water and mix well. Cover the meenchatti and cook for 5 minutes. After 5 minutes switch of the flame. Crush the grated coconut, shallots, fennel seeds, green chillies together in a blender to make masala. Heat coconut oil in a pan and add mustard seeds. When they spultter add curry leaves and crushed masala. Saute for 3 minutes. Add cooked fish, salt and stir well. Cooke for 5 minutes until the whole water content is dried up and switch of the flame. Kozhuva Peera Pattichathu is ready.